I am lying here in bed feeling my ovary working hard to ovulate and while my initial and most common reaction is to cry out in pain and writhe around in misery, today I am trying something different. Today I am trying to send a message of gratitude to my ovaries. I am grateful they (at least the right one since it is the only one that ovulates) are able to ripen an egg and release it every month in the hopes of forming a new baby. Why the change in my attitude today? 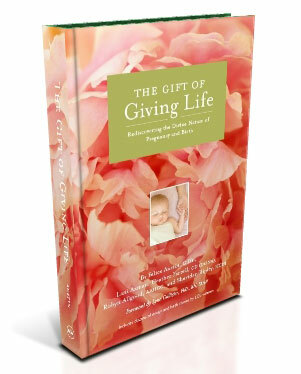 I have been reading a glorious book, The Gift of Giving Life, that is hot off the presses. My friend, Robyn Allgood, is one of the authors and asked me to take part in a Virtual Book Tour that is running from Mother’s Day to Father’s Day and I am one of the last stops. The other tour stops have been food for my soul and I bet they will be for yours as well. This book is a compilation of essays, birth stories, and articles about the divine nature of pregnancy and childbirth by women who belong to The Church of Jesus Christ of Latter-day Saints. I am SO in love with this book. I wish I had written it! In an amazing feat of literary genius, the authors have created a lovely blend of childbirth information, personal stories, and scriptural insights, all with the nurturing tone of a warm blanket and a cup of hot chocolate. One of the many wonderful aspects of this offering is that there is a wide variety of perspectives on both the spiritual and physical elements of birth. This is not a one-size fits all approach. Rather, it is a ‘step into my heart and let me share some of my deepest thoughts regarding my experiences as a woman’ type of book. There are stories about conception, labor, breastfeeding, adoption, miscarriage, abuse, service, abandonment, faith, courage, submission, and most of all, love. Each time I read a new essay, I am left with a feeling of love…love for the woman who shared herself through her writing, love for my Heavenly Parents, love for myself as a mother, and love for womanhood. It is a daily gift I give to myself…one story a day to soothe my soul, awaken my mind, and expand my heart (though I usually can’t stop with just one!). When I was reading Felice Austin’s essay, “The Decision to Have Your Baby”, and Meghan Rayne-Matthews’ essay, “Healing Through Motherhood”, I was taken back to my unexpected first pregnancy and the difficult decision we made to keep our baby. I had been told by two surgeons that my abdominal wall and pelvic ligaments would not survive a pregnancy and that we needed to adopt. When we became pregnant with Blythe, we were scared of the very real possibility that I may die. After endless amounts of research in between the round-the-clock nausea, multiple priesthood blessings, temple trips, and many prayers, we decided to trust the Lord and the feeling of peace we were given. We decided to allow the pregnancy to continue and accept the consequences, whatever they might be. Thankfully, the surgeons were wrong and my abdominal wall held up just fine (my pelvic ligaments are another story!) and now we have been blessed to give birth to four babies. When I read “Waiting for Ashleigh” my heart was overcome with love for my unborn babies, the ten we have miscarried and the others who we are waiting for. The father in this story hears and sees his daughter, Ashleigh, several times, including once when he was about to break-up with his future wife. When they do marry, they think Ashleigh will be their first child born, but she isn’t. A little boy arrives instead. Each time they become pregnant they think it is her, but it isn’t. Three little boys and one little girl later, they are thrilled to finally be pregnant with the girl they have waited so long for. And then they miscarry. Matthew, the author, beautifully writes of pain, faith, and hope as they realize that once again they are waiting for Ashleigh. We are never the first in our family to wrestle with a problem, although it may feel that way…learning how other family members have handled their problems similar to our own down through the generations, is one of the most effective routes to lowering reactivity and heightening self-clarity. If we do not know about our own family history, we are more likely to repeat past patterns or mindlessly rebel against them, without much clarity about who we really are, how we are similar to and different from other family members, and how we might proceed in our life. She explains that she researched her line and found a great-grandmother on her mother’s side who had been abandoned by her husband while pregnant with their fourth child and a third great-grandmother on her father’s side who had been a slave and had somehow escaped slavery and raised her white master’s child all alone, in freedom. These two stories gave Felice strength to continue in her own struggles and powerful connections to bolster her up when loneliness tried to tear her down. My mother’s family tree is rich with stories of courage, sacrifice, and faith. They have filled me with great reservoirs of determination to do what is right, to serve well, and to love passionately. I am right in the midst of discovering my father’s family tree. Lerner’s quote flipped a switch in my heart and encouraged me to go deeper, to search for their stories, and to learn from them. Through various experiences in my life I have learned I am strongly connected emotionally to my ancestors and I carry their energy patterns with me. I have an opportunity to learn from them, heal the mistakes of the past, and create a better future for my posterity. The Spirit of Elijah is real, incredibly real, and is drawing my heart to my family members before, with, and after me. This book has played a pivotal role in that heart-opening process. One last thing this book has done for me is it has reminded me I am not alone in my walk as a daughter of God, nor as a birthing mother striving to make conscious, God-led choices for my family. I am not crazy or misled for feeling the spirits of my unborn children. Sometimes, if I am spending too much time in surface relationships, I can forget there are women who care deeply about procreation, about their divine roles as women, and about the gift that birth can be to each of us as we grow in to the beings God created us to be. The Gift of Giving Life is a gentle, yet powerful testimony to the sisterhood of women and the strength we can be to one another as we fulfill our personal missions as daughters, sisters, mothers, and friends. Other favorite essays: “We Are Each Eve”, “The Spirit of Elijah”, “Puah and Shiphrah: Delivering the Deliver”, “Two Veils”, “Blood, Breastmilk, and Living Water”, “Finding My Motherly Intuition”, and “Healing From Sexual Abuse”, “Unity With Our Sisters”, and “Sixteen Pregnancies”. Doesn’t it sound marvelous? Trust me…it is. I wish I had a frillion copies to give to every woman I know. I don’t have a frillion, but I do have one copy to gift to one lucky reader. Please post a comment and you will be entered into the pool of hopeful winners. A winner will be selected bright and early Saturday morning. If you don’t win or you want to buy a frillion copies for all the women in your life, I have a coupon for 10% off The Gift of Giving Life. Click here and then after you add the book to your cart use coupon code GWFWXR3F. This coupon is only good until Father’s Day 2012…so you only have a few days to take advantage of it. Visit The Gift of Giving Life site to sign up for their newsletter and to receive a free Meditation MP3 as well as tips to help increase spirituality in your pregnancy and birth. If you would like to read more of my birth experiences (I think they are pretty amazing stories! ), here are our birth stories and here is our journey through miscarriage. I hope you have enjoyed this stop on the Virtual Book Tour. Be sure to check out Segullah’s post on Sunday. I for one can’t wait to read it! What a wonderful and inspiring post. Please enter me! I’d love to curl up with this book once a day — or twice. Oh man Tracy, you’ve got me tearing up at 7:30 in the morning- Sounds like a beautiful book! Your words about it are so inspiring. Ah, Jess, it is fantabulous! It is the perfect blend of deep, doctrinal truths about womanhood and practical information about birth. Oh how wonderful this sounds Tracy! Just having had my sweet baby, I’d love to read this. I had such a wonderful birth with him despite the nurses wanting to induce me. I’m so grateful I was able to birth him the way I wanted, without the drugs and that he arrived safely in my arms. I get all emotional thinking of it. It is such an endearing book! You will love it! I am so sorry I haven’t called yet…working on it! Order it today! Really…it is worth every penny. Where are you located? Where are you birthing? I will be sending you wonderful birthing vibes! This sounds like a great book! I’m so glad to hear about these subjects being seriously written about from different perspectives. I bet it would make me feel less “crazy” about my own experiences. So many times as I have been reading, I have thought of you and your motherhood journey. You will love this book! It may be a deep well of healing energy for you. This book sounds wonderful! And the things that our family could learn from this book seem very valuable.Isn’t it funny what things truly speak to your soul. Just what you need right now.Thank you for sharing the things you’ve gained from this amazing book. I hope we win! Cami, I think you would cry all the way through it! You will love it! Such a beautiful beautiful review! Thank you and I read your post about your ten losses. It made me cry. So sorry for your pain. Thank you Mandy! My miscarriages have been such a journey of pain, self-discovery, and ultimately, faith. I am grateful for the lessons I have learned and am blessed to be able to a listening ear when other mamas find themselves on this path. I’d like to enter! I have an essay in the book, and I have yet to read the book! Welcome to WOK! I will read your essay tomorrow! I would love to enter the drawing! I’ve been dying to have the book, following every post of the virtual book tour, but I’m on a very tight budget and I’ve had a hard time justifying the purchase. Thanks for your wonderful review. I’m glad to “meet” another friend of Robyn’s. You don’t have to enter me, I already have some copies :) but I wanted to say hello and I’m so happy that your heart feels larger. May you be blessed with all the desires of your heart and many more things you didn’t even know were possible. I loved your essays in the book! Thank you so much for sharing your heart and having the courage to speak truth. Obviously I do not need to enter the drawing but I just wanted to say I LOVE YOU! I feel so blessed that our lives have crossed paths. Ahhh, I love you too! Thank you for inviting me to be part of this book launch! It has been a wonderful experience and reading the book has given me much food for thought. Mary…you are so, so sweet. Thank you for being a powerful example of loving womanhood! I’m so glad you are enjoying the book! As the mother of 4 daughters, grandmother to 16 grandgaughters, 5 of them starting their own journey into motherhood making me a great grandmother of 4 with two on the way (one due yesterday as I write), Your personal thoughts as well as insights into the book “The Gift of Giving Life” are a joy to my heart! I have always had similar feelings and long to have my sweet grand daughters feel the same way about the beautiful fulfilling gift they have been given to be giving life to those tiny souls they are birthing. I would so love to read this book! Please put me in your pool of hopeful winners! I just dropped in after updating my feed reader & read some amazing posts. You are such a beautiful, strong woman with so much to teach & so much love to share. Thank you for sharing your story with me. Miscarriage hurts so desperately bad & sharing the feelings helped my pain so much. Big (hugs) to you & yours. Thank you for dropping by! You are a gem of a woman and bless many lives. Miscarriage has in many ways defined my mothering years…but in mant ways it has not. It is so strange and bewildering and refining. It is so, so good. Perhaps you will win! Or you may have to wrestle Mary for hers!